Tina Salzarulo is all smiles after receiving the Boston Post Cane at a ceremony on January 25 at the Surry Town Office. Tina Salzarulo is a name most people in Surry are familiar with. She has been an active member of Surry’s Arbutus Grange for 80 years, attends many town functions and celebrations, and, as of January 25, the latest recipient of the town’s Boston Post Cane. At 95 years old, Salzarulo received the cane as the town’s eldest living resident. Historically, the Boston Post Cane was given to each town in New England in 1909 by then Boston Post publisher Edwin Grossinger, with the intent that the towns would give them to the oldest man. Once that man died, it was to be given to the next oldest man, and so on. Since that time, many towns have done away with the “men only” aspect of the award, explained Surry Selectman Steve Bemiss during a celebration for Salzarulo. Now, the cane is given to the oldest living resident, man or woman. Selectman Rebecca Collison recounted Salzarulo’s history in town, from age 2 all the way up. 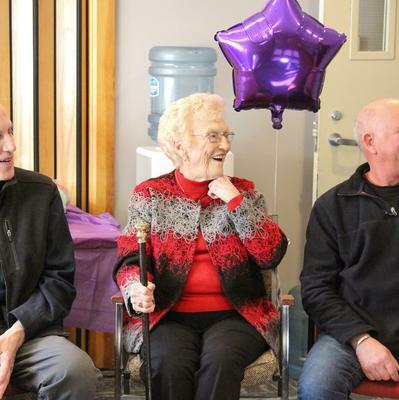 The Surry Town Office meeting room was standing room only for the ceremony, as Salzarulo’s friends, family and even her two sons Don and Dane were there to celebrate the occasion. After receiving the cane, Salzarulo was asked what her secret was for keeping herself healthy throughout the years. Salzarulo will be able to keep a replica of the cane with her at her home, while the original cane will be kept at the town office. Bemiss reminded her that there will still be occasions she will “be allowed to touch” the cane. “Any time there is a town function, you show up and it’ll be there for you,” he said.